Drain the presoaked ham fillet and place it in a large pan. Cover with fresh cold water and add the peppercorns, star anise and bay leaf. Cover with a lid, bring to the boil and reduce to a simmer. The ham needs 25 minutes' cooking time per 500g, so this one will need 2 hours 15 minutes. Meanwhile, prepare the ham glaze by simply mixing all the ingredients together in a small pan, then simmer for 5 minutes, until reduced by half. Remove from the heat and set aside to cool and thicken. Next, to make the mash, place the potatoes in a large pan and cover with cold water. Bring to the boil, then reduce the heat and simmer for 5 to 7 minutes. Add the apples and cook for a further 8 to 9 minutes, until tender. Drain, return to the pan and dry out on a low heat for 1 or 2 minutes. Add the butter, then mash until smooth and season to taste. Set aside. Once cooked, remove the ham from the water and pat dry with kitchen paper. Leave aside too cool a little. Meanwhile, discard the outer cabbage leaves and cut the head into 1.5cm-thick slices. Lay them flat in a single layer on a large baking tray. Mix the oil and garlic together in a small bowl and brush this over each cabbage 'steak'. Pop in the oven to roast for 30 minutes, turning halfway through. Carefully peel away the skin from the ham, leaving the layer of fat intact. Use a shark knife to score the fat in a criss-cross pattern. Stir the ham on a baking tray lined with non-stick baking paper and spoon the glaze all over. Roast in the oven for 20 minutes, until sticky and golden. Reheat the mash and spoon onto each serving plate. Stir a cabbage steak beside it. 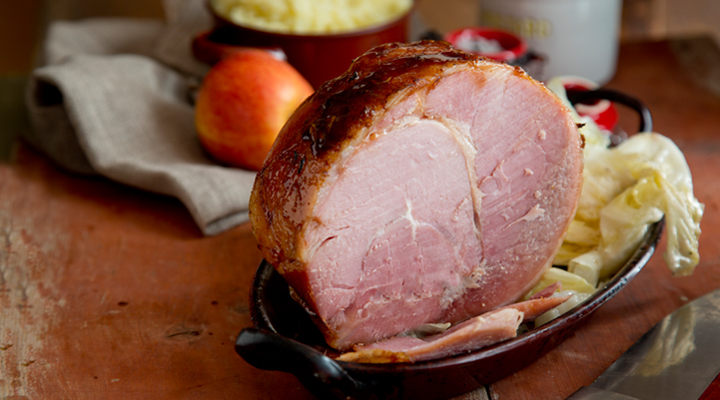 Carve the ham into chunky slices and arrange on top. Spoon any sticky glaze over and serve at once with mustard.